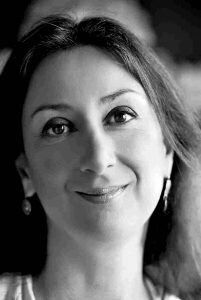 Since I first heard of Daphne Caruana Galizia’s death, I’ve thought of little else. And that’s not likely to stop now. It started with shock at the audacity and the terminal definitiveness of the act. It grew into anger and indignation. There was a strong sense of loss as I looked for the writings of the best and most prolific writer about Maltese political affairs and found a screen unchanged. I felt embarrassment as I cringed at the questions of the world press about how such a thing could be possible in this paradise. And then helplessness: in the face of indifference, in the face of hate, in the face of unmovable incumbency. Resignation in front of a young generation that we have drugged with things instead of thoughts. Dismay in front of a society of two deaf nations fighting an unending war in a single country. Despondency in front of a future that looks worse than the present. Every time my system got the urgent need of the fix from her writings, I treated withdrawal with writing of my own. By typing away furiously I tried to fill the emptiness of a screen that would add nothing to those dark, despairing words. ‘There are crooks everywhere you look now. The situation is desperate’. I needed to turn that page every day and every waking hour. To muster enough hope to get me out of bed. And for two weeks the depth of my feelings and the darkness of my despair were such that I had to invest everything in them. And I did. I am not sure I am ready to get out of the moment and look ahead. Because with the passing of days new layers of darkness set in. I posted yesterday the image of a text written by a man who wrote he would want protesters like my wife and my daughter mowed down by a truck for having a thought he does not agree with. As I re-read my post this morning I saw my own words of anger and disdain that I rationalised on the back of the extremity of the subject matter. But by justifying retribution, by repaying an eye for eye, we are never getting out of this. I have not had a Damascus experience. I am not going to enthusiastically turn the other cheek in the face of the unbearable hate, the vacuous amorality, the pathological self-centred egotism, the greed and diseased corruption. I would be an accomplice if I forgave it and forgot it. But the error in my judgement is in accepting this is inevitable. That this is some sickening requirement for a culture and a nation unable to break free of its demons, that there is no way out of this hell on earth except living in it painfully aware of the inevitability of its mediocrity. I have read too much history to wax melodramatic about a lost golden age. But it was not always like this. We got to this point with a systematic and progressive degradation of the fabric of the nation of which the government is not the cause but the symptom. Firstly a mammonist faith that has permeated us all, rich and poor and especially those in between. A national religion where the accumulation of wealth is an end in and of itself pushing aside any sense of ranking the beautiful over the ugly, the kind over the spiteful, the old chestnuts of women and children first. That sort of thing. From that, the misguided rankings of identity that vary from town to village and from Sliema to Mqabba but are equally perverse wherever. Where belonging to clubs, parties, societies, associations and communities is defined by the viciousness of the virulent taunting of the other. That people are prepared to ignore their self-respect to express bewildering disdain for the rival band club or the rival football club or the rival party or the rival whatever it is the focus of derision is on, on the day. From that an institutionalised embarrassment of both church and state to measure performance and success by ethical rather than statistical standards. That the thousands dressed as plastic, cartoon Roman soldiers on Good Friday are somehow an indicator of a love of enemy as one would oneself. That the thousands of cranes and hours of traffic jams are somehow an indicator of the health and prosperity of the nation. From that a cultural abhorrence to culture. Where aesthetics are a luxury for the effete and the ascetic. Where indulgence in knowledge and thought and art and poetry are a sickness while indulgence in profusion and pleasure, in ostentation and bling are a new morality. From that a political dialectic that relishes the clash but is uninterested in a synthesis that seeks resolution and progress. A political process where consensus and coalition is a weakness and strength is in categorical, uncompromising, wilful, loud and angry diktat. Where debate is on prescribed scripts and thought as an individual endeavour is discouraged to the point of intimidation. From that an entitled isolationism that refuses to even contemplate contrasting views from outside the narrow circle that identifies itself as local. An angry parochialism, hostile to bloody foreigners who should go back to their country unless they’re on their knees washing the floor or paying stratospheric rents. From that a prejudiced categorisation of views not by their quality or originality but by the likely intent of those who mouth them. Two boxes of Nationalists and Labourites in which anyone from pope to pauper must fit and by virtue of that fit must be either always right or always wrong. From that an intuitive compromise with what should not be accepted in the favoured box and a furious, unforgiving anger with what should find compassion but never would while stuck in the hated box of the others. From that a moral ambiguity, a grotesque set of inconsistencies that cancel each other out and allow us to justify ourselves to do what sensibly we must not and forgive ourselves with brazen confidence that our supporters will turn our guilt into an asset. From that our inability to accept having our faults as people, as families, as villages and as a nation pointed out to us and our fallacious retort that nobody’s perfect and therefore no one is entitled to criticise, to attack and even to judge. From that the contrariwise notion that since nobody’s perfect, the strive to do good is arrogant self-aggrandisement or delusional idealism. And I realise with horror that Daphne Caruana Galizia’s life work was not only lonely because of her investigations into corruption and impropriety. It was a lifetime of anthropological research in the depths of a society that refuses to study itself and resents being told what’s wrong with it. The horror comes with overwhelming exhaustion at the sheer scale of the effort. That hope is a scant source of energy in the face of such gleeful and self-satisfied resistance to change. The horror comes with despair that having the great walls of Rome crash about our ears is more than any one of us can do about. And yet we have a duty to seek change. We have a duty to attempt at least to persuade those who would not listen to us. We have a duty to be strong in the ideals that keep us morally and spiritually alive because we must fight the moral and spiritual death about us. We must, even in the despair of all that is around us, continue her work. France 24: Will the murder of Maltese journalist Caruana Galizia go unpunished?